Earlier today, Fort Smith, Arkansas-based carrier ABF Freight, a division of logistics company ArcBest announced 12 drivers for its 2018-2019 ABF Freight Road Team. ABF Freight reports that the 2018-2019 Road Team members hail from employees working at ABF service centers across the United States from locations across the United States and Canada with members selected based on merit of driving skills and outstanding customer service. 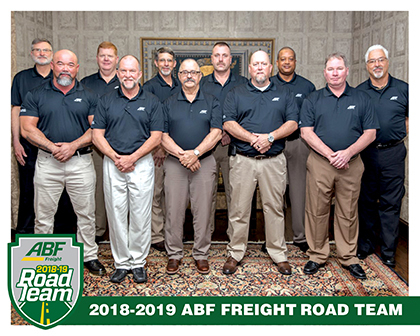 "We are proud to have these exceptional representatives among the ranks of ABF Freight's professional drivers," said ABF Freight senior vice president of Operations and Safety, Mark McMinn. "Each Road Team member has superb driving skills and an outstanding safety record. Their commitment to our customers' goods, as well as their commitment to the safety of the driving public, makes them excellent ambassadors to represent ABF Freight and the trucking industry." According to ABF, in order for a driver to be eligible for the ABF Freight Road Team, candidates must have a minimum of 10 years driving experience as well as a driving record free of accidents and other violations that may impact a driving score. Additionally, sources from ABF Freight report that inclusion in the ABF Freight Road Team is among one of the highest distinctions that driver may receive from the company. "With drivers like these, it's no wonder why ABF Freight has been a trusted partner our customers have depended on for over 95 years," said McMinn. ABF Freight reports that members of the Freight Road Team serve as ambassadors for the company and will be available for speaking engagements in order to dispense information about the trucking industry and how it may relate to safety. Interested parties may visit ABF Freight’s website for more information.